Hip dysplasia is considered to be the most common orthopaedic disease in dogs. Animal physiotherapy and rehabilitation can dramatically improve the quality of life and mobility in dogs with hip dysplasia. In this condition, abnormal growth or development of the hip joint occurs, which leads to various degrees of subluxation of the joint, shallowness of the acetabulum, joint incongruity, and degenerative changes in the joint. Hip dysplasia is a multi-factorial disease, which means that there are several factors which can influence the occurrence of the condition. The genetic make-up of the dog is the most important factor. Rate of growth, nutrition and exercise level all influence the chance of developing hip dysplasia and the severity of the disease. The stages of hip dysplasia go from laxity to degeneration. Laxity begins when the dogs are puppies and proceeds to degeneration with increasing age. Large breed dogs tend to be more prone to hip dysplasia but any breed may be affected. Initial signs of hip dysplasia are usually based on the owner’s observation of gait abnormality or lameness. However hip dysplasia is usually bilateral and many dogs do not present with a unilateral lameness. They may present with difficulty rising from lying or sitting, inability to jump, bunny hopping, reluctance to play or go for a walk, or a waddling hind limb gait. Exercise makes the dog worse and they are often very stiff to rise after resting. Diagnosis is made on a combination of patient history, clinical signs and radiographic examination. They tend to be painful on hip extension and abduction, and palpation over the hip joint. The focus of management will depend on the age of the dog and severity of symptoms when the diagnosis of hip dysplasia is made. Management may be medical, or surgical or both and needs to be discussed with your pet’s veterinarian. There are many surgical techniques that have been devised to manage hip dysplasia, some reconstructive, and some salvage procedures. Reconstructive surgeries include juvenile pubic symphysiodesis (JPS), triple pelvic osteotomy (TPO), both done in growing dogs. Salvage procedures done once growing has ceased include femoral head and neck excision, total hip replacement, and denervation. 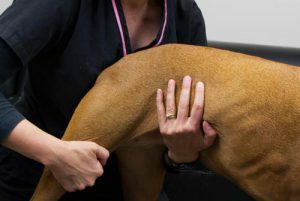 All dogs with a diagnosis of hip dysplasia, whether managed medically or surgically, benefit from physiotherapy to make their life more comfortable and improve mobility. At Dogs In Motion, we will work with the veterinary surgeon to provide your pet with a tailored rehabilitation program, specific to your pet’s needs and time since diagnosis or surgery. Treatment ideally would start 5 -7 days after surgery, or on diagnosis if being managed conservatively. Treatment may include manual therapy techniques such as massage and joint mobilisation, modalities such as heat and ice or dry needling for pain relief. Advice on appropriate bedding will be provided to ensure your pet is well supported. Hydrotherapy plays an important role in the rehabilitation program of dogs with hip dysplasia Underwater treadmill is ideal for patients with hip dysplasia. The buoyancy of the water means strengthening can occur with less joint loading and pain. This is ideally performed 2-3 times per week for acceleration of muscle growth. Strengthening of the surrounding muscles will help support the hips and reduce pain. Overall, the prognosis in most cases of hip dysplasia is good, if diagnosed and treated early. As degenerative joint disease progresses, the prognosis for your pet to return to a pain and lameness free gait diminishes. Long term exercise restriction and lifestyle modification will be required to keep pain and lameness to a minimum. You animal physiotherapist can devise a lifelong exercise program, specific to your pet’s needs.